As is nearly always the case with this type of article, the authors conflate some modalities which probably do provide benefit for some patients, with those which certainly do not (other than non-specific placebo effects). This skews their results from the get go, and the publication of such an article merely serves to strengthen the widely held opinion that this journal promotes quackery. Sigh. Massage can help some musculo-skeletal conditions; some osteopaths do massage, but unless it can be shown that manipulating the skeleton has an effect on tissue vascularity, that ain’t osteopathy; likewise, unless adjustments can be shown to have released ‘innate intelligence’, that ain’t chiropractic; yoga and meditation, shorn of their esoteric elements and fake rationales, do help many folks, as does hypnosis. 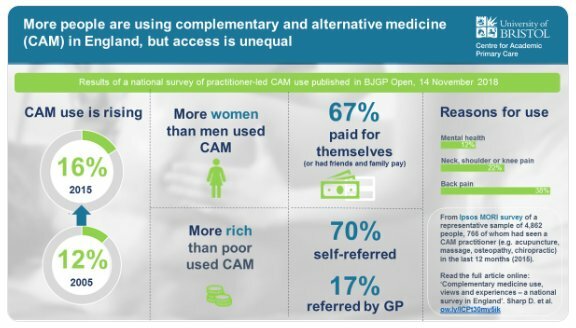 The modalities in above paragraph should not be regarded as ‘CAM’ as they do have support from a reasonable evidence base. The others listed do not. To conflate them is mischievous (and unethical) – as the authors must well know. Why do they have yoga and Pilates on this list? Yoga as practiced in the US (and probably the UK) has little in common with the ascetic and meditation practices of the the original. The exercises most people think of are actually gymnastics borrowed from Europe. There’s no woo in real Pilates. It’s a series of exercises designed to work smaller muscles which most people, especially athletes, don’t use much in ordinary life It’s somewhat outdated so not necessarily the best possible way to correct muscle imbalances and prevent injury. People are more likely to try something if they don’t have to pay for it. Who knew that? CAM proponents – for that is what this group of “researchers” are – think we should consider making it available on the NHS. I would like to suggest an alternative conclusion: “It is concerning that as many as 16% of the population have used CAM within the last 12 months as most CAM doesn’t have evidence of effectiveness for any health condition and there are also risks associated with CAM treatments. Policy makers should consider the following two actions to address this issue: a) better education of members of the public about the lack of evidence and scientific rationale behind most CAM treatments and the potential risks b) gaining a better understanding of the gaps in current NHS services that result in people undertaking CAM, with the longer-term aim of addressing these gaps with science- and evidence-based treatments”.